We are really into extending things and making them look bigger. We nailed it when we extended our fireplace to the ceiling and made the room look so much taller. We also just extended our lower kitchen cabinets by adding open shelving and a tilt out trash can. 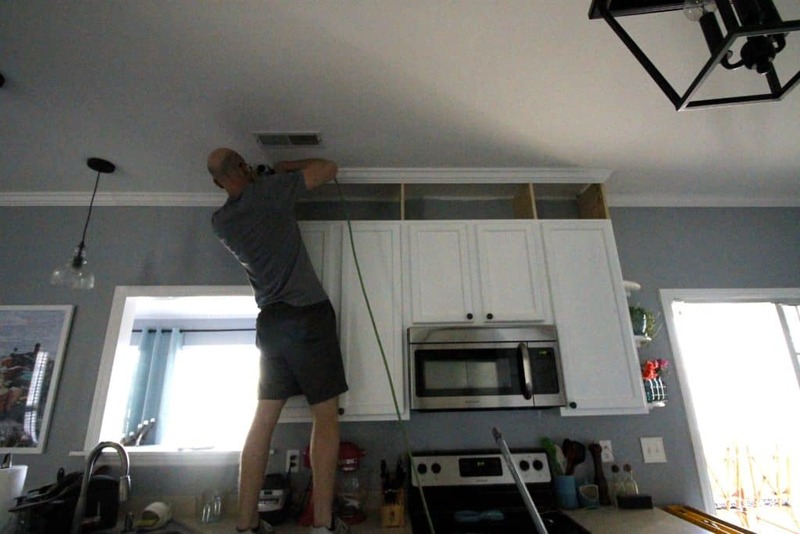 But the newest thing we did was extend our upper kitchen cabinets to the ceiling using one piece of wood. 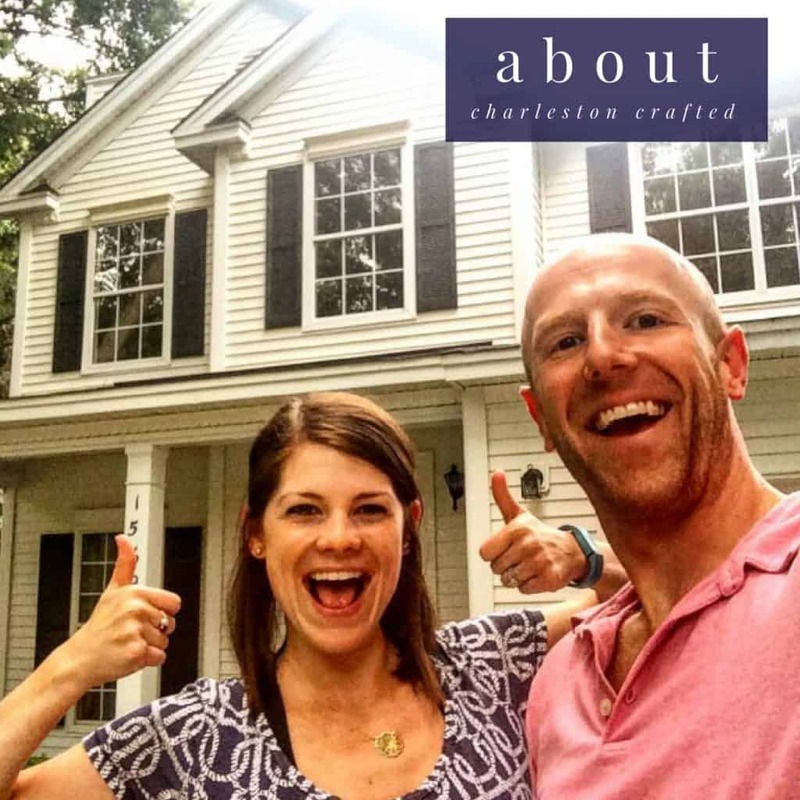 Be sure to check out the final results of our DIY coastal kitchen renovation! This project is easy to do. We were extending the crown molding into the kitchen that we put up in the rest of our first floor and wanted to take the time to add height instead of just running the crown molding behind the cabinets. It’s simple. I got a six foot 1×12 board and cut it into four 12 inch sections. 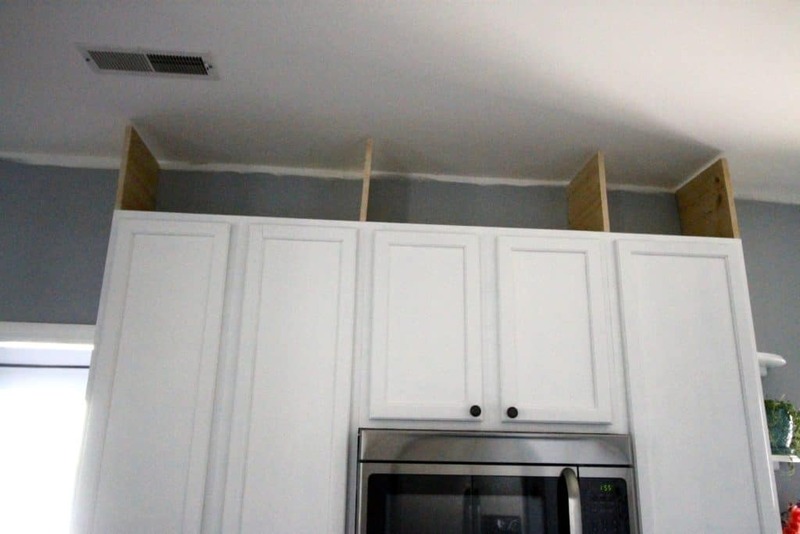 Using L-brackets and a nail gun we attached them to the top of the cabinets and the wall. Then, we ran the crown molding around the front of these and shot nails into the boards to make it look like they were part of the cabinets. Then we painted the inside and out the same color as the cabinets and voila they all look like one. Now the cabinets look SO TALL and it makes it feel like we have so much more height in our kitchen! A lot of people have asked us for advice on how to decorate over your kitchen cabinets – honestly, I think that extending the cabinets to the ceiling looks much nicer than filling the gap with fake plants! 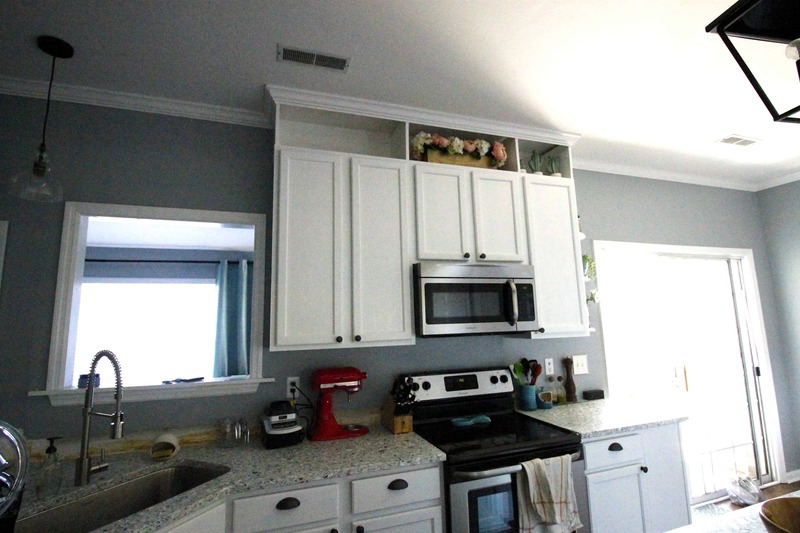 I hope that we were able to show you how easy it is to extend your kitchen cabinets to the ceiling. I love cabinets that go to the ceiling! I feel like they’re just floating there when they don’t. This is a great project. thanks so much! I agree it was so simple & really really makes them look more built in. Wow! This is a great idea! I was just scheduling up some posts to share on our Facebook page in the coming weeks and saw this. Most of the time, open-top cabinets just end up looking bare or cluttered, but your extensions really pull the space together. Mine don’t go all the way up to the ceiling, but the space above is closed off. Kinda wishing it was open after seeing what you did. I love this! These are beautiful. I really want to do this, but I have a few questions if you don’t mind. What size of L brackets did you use? And did you only attach the L brackets to the bottom of the boards? And with the crown moulding, did you nail it to the ceiling? Hi Christie! Thanks so much for visiting and please do tag us if you do do this. The L brackets are just two inches on each side of the angle. So 2×2 brackets. We did those just on the bottom and then used the nail gun to shoot a nail through the top of the board into the ceiling. And yes, with the crown moulding, we nailed it both into the ceiling and into the boards that we had attached. For the moulding on the sides, the nail went through the board, so we then just bent off the part that was showing. Hope this works for you. Please let me know if you need anymore clarification! 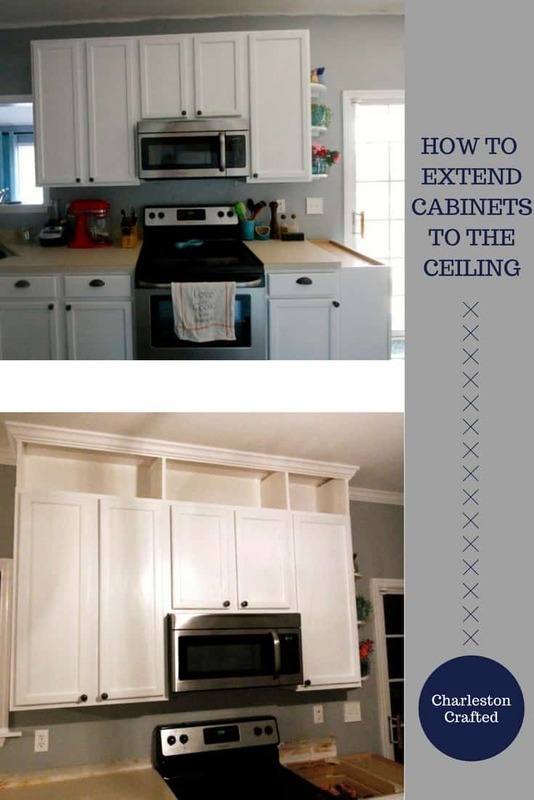 I love what you have done with extending the cabinets to the ceiling and by far the least labor intensive Pinterest post I’ve seen in doing so. Do you mind sharing what gauge of nail and length you used and the size of your crown moulding. 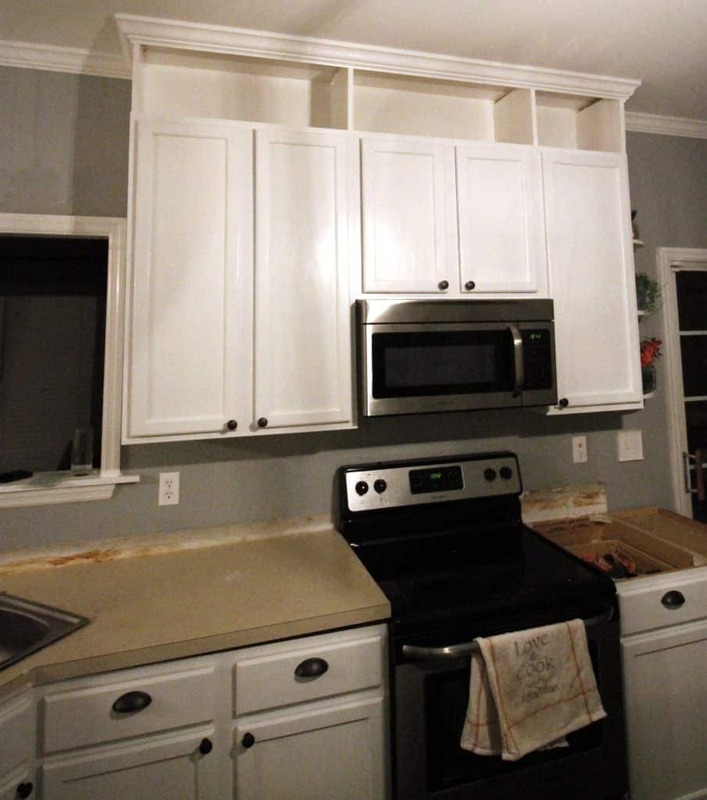 We are hopefully getting our cabinets painted in October and really want to extend the cabinets prior to then. We are also looking to add wainscoting to the end of our cabinets and around our island. Thought it might look neat to apply some to the wall where we extend up. You have a wonderful site and everything is just fabulous, from the photography to the very easy to follow instructions. Hey Paula, so glad you like them! Yes, adding these boards and putting molding around the outside made them look like they had always been there and was super easy to do. We used an 18 gauge nailer with I think 1.5 inch nails, but they did stick out on the inside of the board. It wasn’t a big deal because they aren’t very thick, so I just snapped them off with a pair of pliers and it was fine. Hope that helps. Share a pic with us when you’re done! Hello!! I am redoing my cabinets and this is the best extension tutorial I’ve found. Do you mind taking a photo of how the l brackets are attached? I’m wondering if it’s going to be wobbly with them only attached at the bottom? Or was I reading it wrong? Thanks so much! Hey Victoria! Glad you like it! The L-brackets are just screwed in at the right angles between the board and the cabinet and the board and the back wall. We put the L-brackets at the bottom and it was pretty stable at that point and not wobbly, but then we just used the nail gun to shoot a couple nails through the board into the wall to make sure. Then running the crown around it was yet another stabilizer. But the L-brackets and nails are what really do it. Hope that helps!